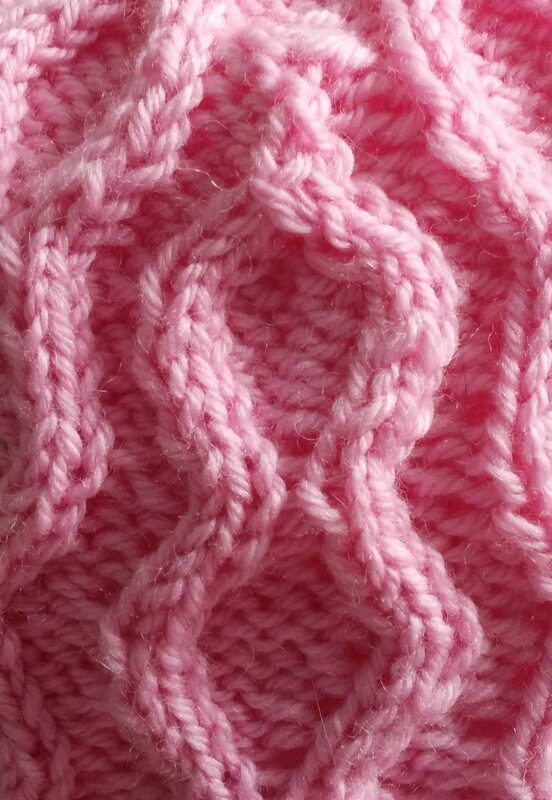 I seem to be making hats the same shape since I went back to the Cables chapter. For this one, I cast on 120 and did one 12 row repeat of the Double Zigzag, pg 266, then decided to continue for a second repeat. Not really thrilled by this, but not willing to give up on that much work, I picked up from the cast on edge all 120 stitches again and did two repeats of Crossed Cable, pg 206 and cast back off. I then went back to the top and finished it off by mostly decreasing 12 stitches on every other row, 2 stitches per 20 row repeat. I first decreased inside the cable by purling 2 together twice, making the cable close faster than normal. For the next decrease, when I was putting these two stitches to the outside of the cable, I purled them together with the stitches already on the outside of the cable. Next time, I crossed the two sides of the cables together and held the top two stitches in front of the back two stitches and knit through both stitches together. This both crossed and decreased the cable simultaneously. 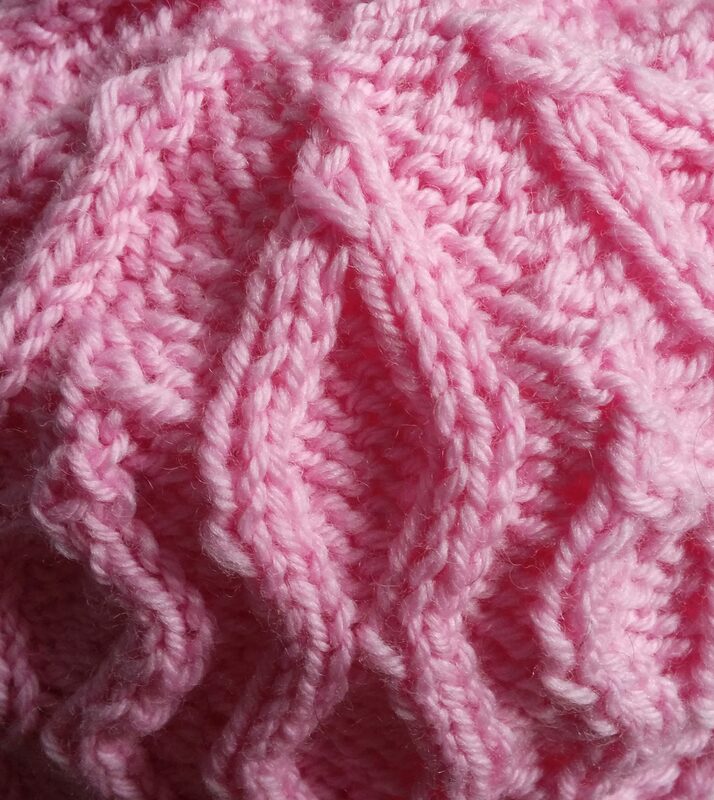 Next time, I only decreased six stitches in the round by doing a slip one, knit 1 psso at the top of the cable. For the next 2 decreases, I did a purl three together above the cable I had finished off until the other cables started coming together I decreased the other cable like the first one by simultaneously crossing and decreasing the top of the cable, then doing a slip 1 k1, psso. Next decrease was a p3tog above the cable I had finished first. After I plain round I then just did continuous purl two togethers until I had six stitches left and pulled the end through. 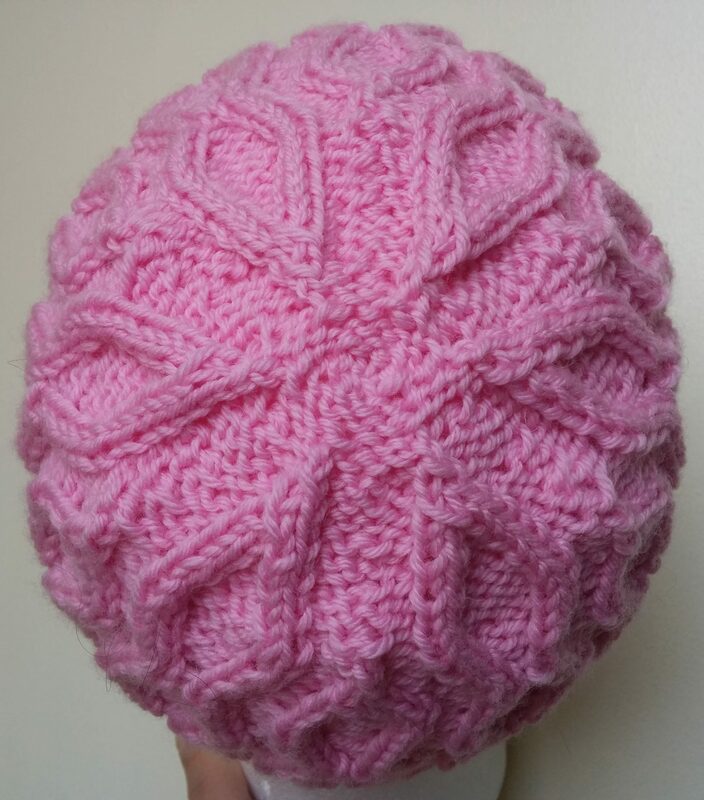 This entry was posted in Barbara Walker and tagged A Treasury of Knitting Patterns, Barbara Walker, Cascade 220, knitted hat, knitting, Knitting and Crochet on February 28, 2017 by gillianknitter. Cool diamondy pattern. Is ot possible to have the background pink and the raised diamondy shape in black. I think that would be attractive. Yeah that might be both possible and attractive.